Dr. Sally Crisp, faculty emerita in the Department of Rhetoric and Writing, gave a luncheon address at the 2018 conference of the South Central Writing Centers Association hosted by M.A. 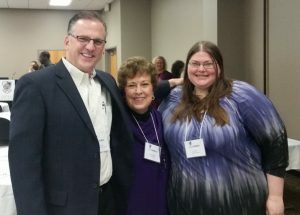 alumna Carey Clark at the University of Central Arkansas (February 22-24, 2018). Dr. Crisp and Barry Maid organized and founded SCWCA in 1989 with a group of writing center directors from Arkansas, Texas, Louisiana, and Oklahoma. Sally was the first SCWCA President and returned to SCWCA this year to recall that time and to celebrate SCWCA returning to Arkansas for another convention. Current UALR Writing Center Director Dr. Allison Holland and other writing center directors from UT Austin, UT Rio Grande Valley, and UCA led a round table session titled “Encouraging Mindfulness Among Consultants.” Dr. Holland’s presentation focused on the importance of utilizing multi-layered mindfulness in the UA Little Rock, where the writing center staff is a blend composed of new and returning credit students, volunteers, and graduate assistants. Dr. Allison Holland (center), UALR Writing Center Director with Amy Rhea, M.A. Student in Rhetoric and writing and Cole Bennett, Director of the Writing Center at Abilene Christian University (ACU) and Rhetoric and Writing Alum. At the annual SCWCA business meeting on the final day of the conference, Dr. Holland was re-elected the Treasurer of SCWCA for another 2 year term. 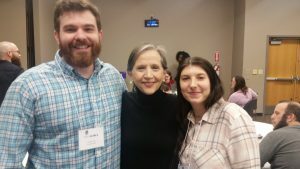 The writing centers at UA–Little Rock and UCA were represented at the conference along with writing centers from UA-Fayetteville (Walton School of Business), UA Monticello, Hendrix, and Henderson State.